Lieutenant Bills abruptly stopped walking, and lowered the datapad. An odd scent wafted from an open door, instantly distracting him. He pushed open the door and edged inside, only to find himself in a poorly-lit storeroom. A small crate stood open, and he reached inside with trepidation. A moment later, he withdrew some of the contents - a darkly-colored cigar. "Let me light that up for you..." the older man said, as he leaned forward out of a darkened corner, just a few feet away. A small tongue of fire snapped to life, making ominous shadows of crates and containers dance about the dimly lit chamber. The young officer jumped, dropping the datapad to the floor. Nervously, his gaze worked its way across the cluttered room. "What is this?" He took a breath, and held up his cigar, letting the flame wash over the tip. "Where did these come from?" "Serpentis. Or at least, somewhere near there." Tarainis leaned back against a crate of holoreels, and took a deep puff off of his own cigar. "Criminals, they may be... but they certainly know how to enjoy the finer things in life." 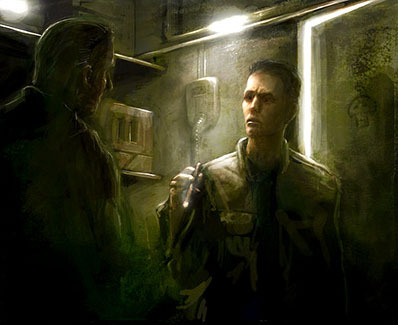 Bills stared at the old man for a moment, then looked back at his own cigar. "That would make these... well, contraband, wouldn’t it? Won’t we get in trouble if..."
The fellow gave a sly grin. "Don’t let the lack of uniform fool you, egger. I outrank you, and almost everyone else at this station." He blew a smoke ring in Bill’s direction. "Besides, none of this exists." "Some of your comrades caught a shipment of boosters coming out of Serp’ Prime." He gestured with his cigar. "These were on board, as well. Not on the cargo manifest, though... they don’t know where they came from, so AURORA got them. They don’t care how we dispose of them, so long as they never see them again." He took a deep puff, and smiled. "So, we’re incinerating them." The lieutenant nodded slowly. "I’ve seen the name AURORA on memos, but never understood what it meant. What does it stand for?" "Auxiliary Union for Rallying, Observation, Recording, Analysis." "Ahh... alright." Bills looked around the room again, for a second, before continuing. "And what does that all mean?" Tarainis smirked, and reached over to the nearby terminal. The screen flared to life, displaying one of the main thoroughfares of the station. CONCORD officials hurried about, each with their own agenda and purpose. "We handle the jobs that they don’t. The ones that fall between the cracks." He tapped a bit of ash from the end of his cigar. "We started out as information gatherers, making sure that the right information got to the right people. It was only natural that we become the historians, as well." He gestured at a neatly-stacked tower of pressure crates. "See those? Data arrays, due to be shipped out to the archives. You would be amazed at what’s in there... Video footage of that battle in Passari. Last night’s Clash match scores. Minutes from the Sanitation Committee meeting". The younger man coughed, and sat up more attentively. "Why do you need all that junk?" "You never know what is going to be significant, or to whom. So, we collect it all." "Doesn’t sound that bad a job," the lieutenant mused. "At least you get to see all kinds of interesting stuff, right? Beats patrolling the inner systems for hours at a time..."
Tarainis shook his head. "That’s what got us in trouble. We were just supposed to move information around, to whom it belonged." He gestured at the viewscreen. "Look at them. They all have a purpose, a job. Try to give them anything even an inch outside of their focus, and they don’t want to know about it. It might as well not exist." He flipped the viewscreen off, again. "That’s why we got our commission. There can’t be a department to cover everything, so our job is to take up the slack. And you are right... it is a great life. One day I may be following a smuggling trail, and the next officiating a wedding." The lieutenant smiled and leaned back, taking another puff on his cigar. "I’m in the wrong line of work." He glimpsed at his datapad, and stood up again. "I’m due in Hanger 3. Thanks for the diversion, though." Tarainis smiled softly, and leaned back into the shadows. "Don’t worry... we’ll be seeing each other again."